Shesmovedon is certainly one of the strongest tracks on the most recent Porcupine Tree album, Lightbulb Sun, with it's slightly funky rhythm, harmonies that send shivers up your spine, and an absolutely blistering guitar solo. The single version is edited down from the album's 5 minutes and 13 seconds, to 3 minutes and 50 seconds. I was sure this was going to butcher the piece, but the editing is brilliant, retaining all the elements of the original. Of course, for Porcupine Tree fans, this is not the reason to buy the CD single. The real reason is for the previously unreleased non-album cuts, both of which are standouts. A cure for Optimism starts as a murky ambient piece that slides into a soft acoustic number, with Wilson's brooding vocals, strumming guitar, and piano filtered through electronics. The real standout though is Untitled, a 9-minute improvisation recorded by the entire band in the studio on March 15, 2000. This is as tasty a slice of moody space rock as The Tree has ever done. Through a foggy beginning, Richard Barbieri's faint electric piano can be heard, with a sound like a cello cutting gently through it. Colin Edwin's acoustic bass eases in joined by Chris Maitland's trebly percussive track of cymbals and rim-shots, whilst Steve provides atmospherics on electric guitar. The piece builds in intensity, whilst retaining a spacey and ambient feel, even when an emerging solo by Steve takes over, carrying the piece to its conclusion. On his web site, Steve Wilson has suggested that the next Porcupine Tree album will be less song oriented, sonically darker and more experimental than previous albums. If Untitled is a taste of things to come, then their next album should be quite delicious. Note: A limited edition CD single of Shesmovedon was also released, minus the two bonus tracks reviewed here, and featuring the album version of Shesmovedon, and a demo version of Russia on Ice. 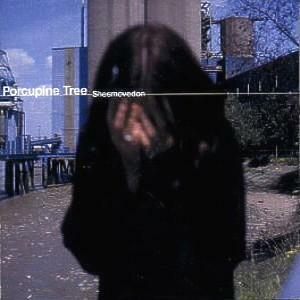 You can visit the official Porcupine Tree web site. Shesmodedon is distributed by Snapper. You can visit their web site.